I have actually just finished this book (4/29/11). I really enjoy historical fiction books. I find them a lot more fun to read then just a normal history book. I have tried to read nonfiction and biographies and I have found that a lot of the time I just can’t get into them I get bored and end up never finishing them. What is great about most historical fiction/novels is at the end of the books they give a description of what was historically accurate and what was thrown in for entertainment value. 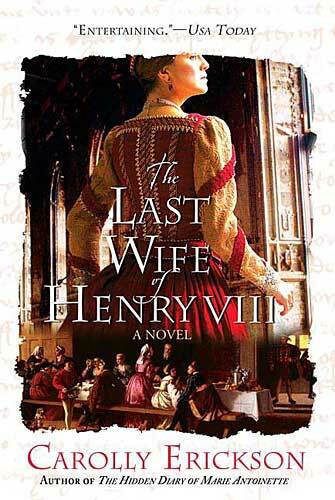 But anyways I decided to read this book because I have always wanted to see how things went for Henry VIII daughters after he was gone. I am planning to read more by this author, I believe she has 4 other books. And well to make it short I found this to be a fun read. Bloody Queen Mary has ascended the throne of England, following the thwarted Wyatt Rebellion that attempted to stop her marrying Prince Philip of Spain. She is determined to convert the country back to Catholicism by burning Protestants at the stake. Honor Thornleigh and her husband, Richard, have been pardoned by the queen for their involvement in the rebellion, and they return to England, but they are not content to sit back and do nothing: Richard works in Parliament to overturn anti-Protestant bills, and Honor uses her contacts to spy, while their son, Adam, robs the exchequer, all in the name of their queen—the future Queen Elizabeth. Honor and Richard and their associates plot to remove Mary from the throne, but Honor finds that the price to do so may be too high. The third in a series about the Thornleighs, Kyle’s novel is an exciting, detailed historical tale of the intrigue and political maneuvering in the Tudor court. This was the first book I read by Carolly Erickson and I absolutely feel in love with how she writes. I Love Erickson’s brilliant use of language and creative escapades thrown in with a history she actually is deeply knowledgeable about which helps make her a leading Historical Fiction author. Just an amazing read overall. Highly recommend it. 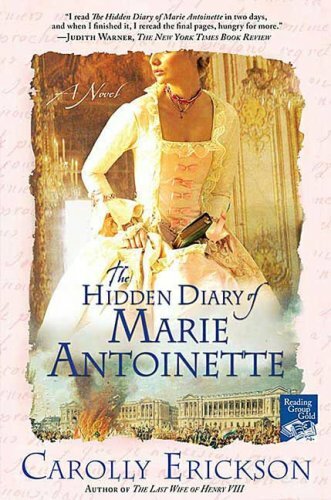 Imagine that, on the night before she is to die under the blade of the guillotine, Marie Antoinette leaves behind in her prison cell a diary telling the story of her life—from her privileged childhood as Austrian Archduchess to her years as glamorous mistress of Versailles to the heartbreak of imprisonment and humiliation during the French Revolution. Carolly Erickson takes the reader deep into the psyche of France’s doomed queen: her love affair with handsome Swedish diplomat Count Axel Fersen, who risked his life to save her; her fears on the terrifying night the Parisian mob broke into her palace bedroom intent on murdering her and her family; her harrowing attempted flight from France in disguise; her recapture and the grim months of harsh captivity; her agony when her beloved husband was guillotined and her young son was torn from her arms, never to be seen again. Erickson brilliantly captures the queen’s voice, her hopes, her dreads, and her suffering. We follow, mesmerized, as she reveals every detail of her remarkable, eventful life—from her teenage years when she began keeping a diary to her final days when she awaited her own bloody appointment with the guillotine. This was the second book by Carolly Erickson that I have read and I must say that I absolutely love how she writes. Her books are an easy read (which for me is a great thing since my attention span is so short and I have a 5-year-old). But she really draws you into the book and makes it so you just don’t want to put it down (at least for me anyways). This book lets you see Catherine Parr before she becomes queen and it’s really quite interesting. I really recommend this book and other books by Erickson. 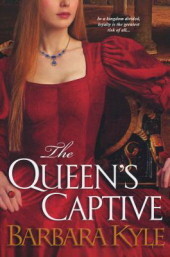 Erickson, known best for her lively and popular histories (nearly 20 of them, including The Girl from Botany Bay and Bonnie Prince Charlie) engages with this fictionalized, first-person life of Catherine Parr, who actually survived marriage to the dangerous and mercurial Henry Tudor (famously, of the six wives), and who is arguably his most interesting bride (not least because she had four husbands). Cultured, well-educated and beautiful, “Cat” catches Henry’s eye as a young girl and variously benefits and suffers from his favor all her life. Often married to others when Henry is single, she is both attracted to and repelled by him, but understands him, she feels, better than most. The factional court tightrope Catherine walks is familiar, as is the religious one; her observations cast Princess Elizabeth (soon to be Elizabeth I) and Baron Thomas Seymour (a husband of Catherine’s who wanted to marry Elizabeth) in a less-than-positive light, and the Church of England priests come off as corrupt as the Catholics they replaced. Catherine surprises and delights as her own woman, one who, in the end, gets everything she wants. Again another Erickson book I have read. 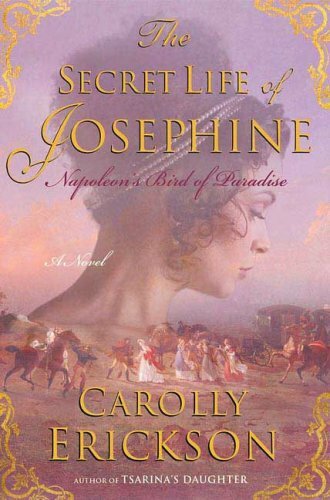 In this book Erickson shows that Josephine was more than just the tainted lady she is historically painted as being. She had a heart and children and loved more fiercely than most of her time. She saw Marie Antoinette fall from power into disgrace. She herself was in prison during the revolution for being the wife of a traitor to the cause. She loved many men and married two whom she didn’t love. This is just an overall wonderful book. Born on the Caribbean island of Martinique, Josephine had an exotic Creole appeal that would ultimately propel her to reign over an empire as wife of the most powerful man in the world. But her life is a story of ambition and danger, of luck and a ferocious will to survive. Married young to an arrogant French aristocrat who died during the Terror, Josephine also narrowly missed losing her head to the guillotine. But her extraordinary charm, sensuality, and natural cunning helped her become mistress to some of the most powerful politicians in post-revolutionary France. Soon she had married the much younger General Bonaparte, whose armies garnered France an empire that ran from Europe to Africa and the New World and who crowned himself and his wife Emperor and Empress of France. He dominated on the battlefield and she presided over the worlds of fashion and glamour. But Josephine’s heart belonged to another man–the mysterious, compelling stranger who had won her as girl in Martinique. My mom gave me this book a few years back and it is wonderful. I highly recommend this book. It is about the more or less private spaces of Marie Antoinette, at Versailles, Rambouillet and Fontainebleau. It’s filled with interesting information and the pictures are absolutely beautiful and plentiful. It’s very easy to read and I think even someone who isn’t that interested in Marie Antoinette will find this book entertaining. 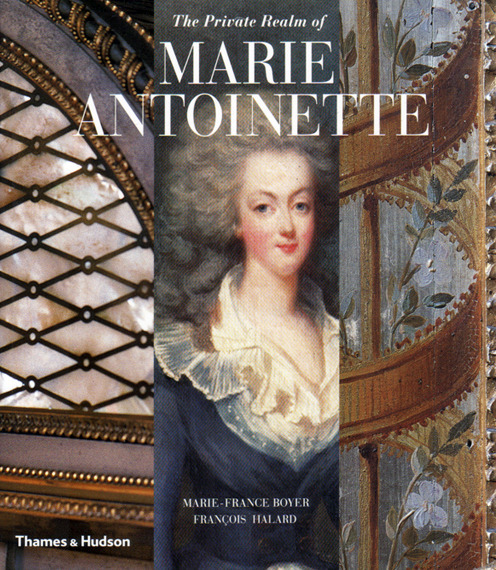 This book turns aside from the official portraits and great historical events to rediscover the private places and objects that reflect Marie Antoinette’s personality and reveal her more directly to our modern gaze. Beautifully photographed by François Halard, the rooms and buildings she inhabited are shown here in fascinating detail, from the distinctive fabrics and furnishings to the queen’s favorite objects—an amber curiosity, a Chinese lacquer gift from her mother, a porcelain bowl. 123 illustrations, 108 in color.